A synopsis of an interview with Jim Rickards, New York Times bestselling author of The Death of Money and Currency Wars, by Edward Harrison at RT Boom Bust. Jim is the Chief Global Strategist for West Shore Funds, former general counsel for Long Term Capital Management, and a consultant to the U.S. Intelligence community and U.S. Department of Defense. The IMF believes $3 billion Russia lent to the Ukraine in 2013 was an inter-governmental loan and not a private loan as the Ukraine has been saying. This gives Russia a seat at the table with work-out options regarding the loan, and they should be as they’re the regional player. The Ukraine situation is a good example of just how politicized the IMF has become. The IMF started out in 1944 as a political project persued by the United Stated to, in effect, dismantle or destroy the British Empire. It was pretty successful. The IMF has always been political but sometimes it’s more overt than other times. People ask how you could possibly lend to Greece. But Greece is under the umbrella of Europe, and Germany in particular, so they’ll find a way to repay the loan. The Ukraine, on the other hand, is very much on their own. They’re not in the eurozone. They don’t have a big brother, be it Russia or Germany, and they’re completely non-credit worthy. The fact that the Ukraine is getting loans for geopolitical reasons, at the behest of the United States to prop up the Ukrainian government in their struggle with Russia, shows how political this whole thing is. When people say the Fed is late in raising interest rates, they’re implying that they should have raised rates a few years ago but that it’s better late than never. That’s not the right way to think about it. That’s a linear way of looking at it and the economy instead goes in cycles. In August 2009, Jim said in an interview that the Fed should raise rates 25 basis points, just a small raise, and not to be in a hurry to raise more. Just to say that they were going to start taking things back to normal. The panic of 2008 was over, there was no liquidity crisis and there was tons of money around. But we were at the beginnings of Ben Bernanke treating the market, investors and everyday people as guinea pigs in some experiment that he dreamed up. By normal metrics the Fed should have raised back in 2009. If they had raised 25 basis points, two or three times a year, then by 2012 they could have got interest rates up to, say, 1.75%, and then they could have stayed there. That way they would have been in a position to cut rates today. They should be cutting today but they missed an entire cycle. It’s not a matter of playing catch up. We’re at the part of the cycle where you should be easing. Not only do you not raise rates into weakness, you should ease into weakness. That’s the Fed’s job. We’re entering weakness and there will probably be a recession next year. The Fed should be easing and instead they’re raising. It’s doing the wrong thing at the wrong time. Part of the reason they raised rates is credibility. Having said so long, so loud and so clear that they would raise in 2015, they had to do something even though there was no reason to raise. Also, they might be trying to deflate some bubbles. But that’s another blunder, because when a balloon pops it doesn’t let the air out slowly — it pops all at once. They’re in danger of popping asset bubbles instead of just deflating them, and causing another financial collapse. Another reason for raising is the notion that they have to raise in order to cut. Well, why not leave them alone? At least you’ll be starting in the right place. Larry Summers says that when we go into a recession, which we probably are, it takes 300 basis points of cuts to get us out. Can the Fed raise fast enough so that they can cut 300 basis points to get us out of the next recession? The answer is almost certainly not — it’s too late for that. They’re not going to get to 200 basis points of rate hikes until 2018 so it’s already too late. We’ll look back at his rate hike as one of the great blunders of the Federal Reserve. They’re forecasting a full point increase in 2016 and another in 2017 but they’ve had a wrong forecast for seven years in a row, by orders of magnitude. There’s no reason to think they’ve got it right this time. They’re implying a hike every other meeting but they’ve also said they’re data dependent. They’ll probably raise in March and again in June, but by that point the data should be incredibly bleak. It’s already pretty bad but by then even the Fed won’t be able to deny it. Employment is a lagging indicator. All the leading indicators are pointing down. Another conundrum is that raising rates makes the U.S. dollar stronger, which is deflationary. The Fed says they want inflation. How do you get inflation with a deflationary policy? This is what happens when you manipulate markets for seven years. They’ve replaced one kind of uncertainty with another kind of uncertainty. The Fed’s balance sheet is at $4.4 trillion. They thought they had to do that to deal with the last financial crisis. What are they going to do in the next one? At what point is there a loss of confidence? The problems of 2008 have been swept under the rug and they’ll come back with a vengence in the next crisis because the Fed will have a very limited capacity to expand the balance sheet more. At that point Jim expects that the IMF will issue the SDR (Special Drawing Rights). There’s no support for the idea that we were globalized on the way up but we won’t be globalized on the way down. Look around the world — Russia is in recession, Brazil is in a severe recession, Japan is in recession, Canada is close to recession. We could have a global recession. The U.S. is not going to escape from that. Forget about trade deficits and surpluses and to the extent that it helps or hurts GDP, and instead look at the absolute value of imports and exports. World trade contracting is one of the scariest things you can look at in international economics. That’s exactly what happened in the Great Depression. A country in an international economy cannot have an open capital account, a pegged exchanged rate and an independent monetary policy all at the same time — that’s the Impossible Trinity. They can do it for a short time but it’s not sustainable. Something will break which makes it an excellent forecasting tool. China had the Impossible Trinity for a while but they’ve had massive capital outflows of $600 billion. They had $4 trillion, which seems like a lot, but once it starts to walk out the door the tempo picks up and it’s never enough. How doees China stop the outflow? They’re not going to close their capital account because that would anger the IMF and China wants to be in the SDR basket. They’re not going to give up independent monetary policy because they want to be able to cut interest rates and stimulate their own economy. The only part of the trinity left is to devalue their currency. They did a shock devaluation last August and now it’s going down day after day after day in baby steps. This will continue. QE and Helicopter Money both involve the Fed printing money. With QE, the Fed prints the money and gives it to the banks, who supposedly lend the money out to stimulate the economy. The problem is that the banks haven’t done anything with it. Helicopter Money is different — it involves a combination of fiscal policy and monetary policy. First is fiscal policy, which in the U.S. is Congress and the White House agreeing to spend more money. That spending increases the deficit. The Treasury borrows the money to cover the deficit by issuing bonds, and the Fed buys those bonds. It’s still the Fed printing at the end of the day, but the money doesn’t sit in the banks. We saw an example of this with the December budget. Jim doesn’t see any coincidence that the Fed raised rates at the same time the Congress busted spending caps and announced a spending bill with all kinds of presents to special interest. It’s like passing the baton. It’s like the Fed saying they’re out of the easing game. They did the best they could and now they passed the baton to Congress. Congress now takes the baton and spends more money. It’ll include all kinds of spending — military spending, infrastructure… presents for everyone. You’re seeing the beginning of Helicopter Money and increased deficits all over the world. You’re going to see a lot more of it. 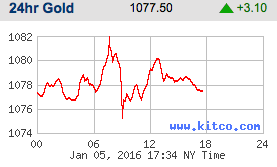 Gold is $1,077.50 U.S. per ounce.